Our house doesn't have a fireplace so I usually decorate the kitchen table or the island for the seasons/holidays. Recently I inherited this hutch from my Grandma so I'm excited to have a set place to display my 'mantels' that won't have to be moved out of the way to have work space. For my Faux Mantel I used the same place mat and Fall letters found here. The rest of the pieces are Good will finds. I fould the 4 candlesticks for $.99 each and the Cornicopia for $1.99. The flowers are left over from a flower pen gift that the PTO provided for teachers. Are you still decorating for fall or have you already skipped to Christmas? I love that most of your decorations came from Goodwill. You are a girl after my own heart. 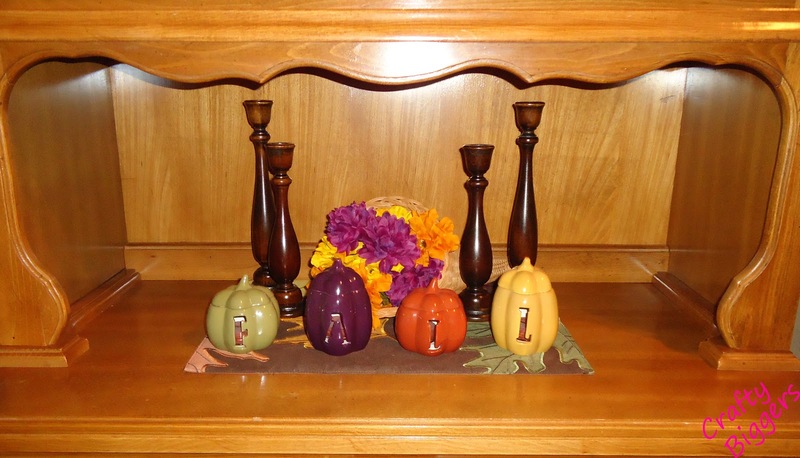 Your newly acquired hutch looks great decorated for fall. Your dad must be very young because it looks like the year I graduated which is 1980. I keep on forgetting that I could be a grandma now since I'm 51. I didn't have my daughter till I was 36, she just turned 15. Your cabinet is a really pretty wood color. Wow! You are an awesome guesser. The picture is from 1978. I was excited that the cabinet matched my existing table.